A cross commemorates those who served in World War One. 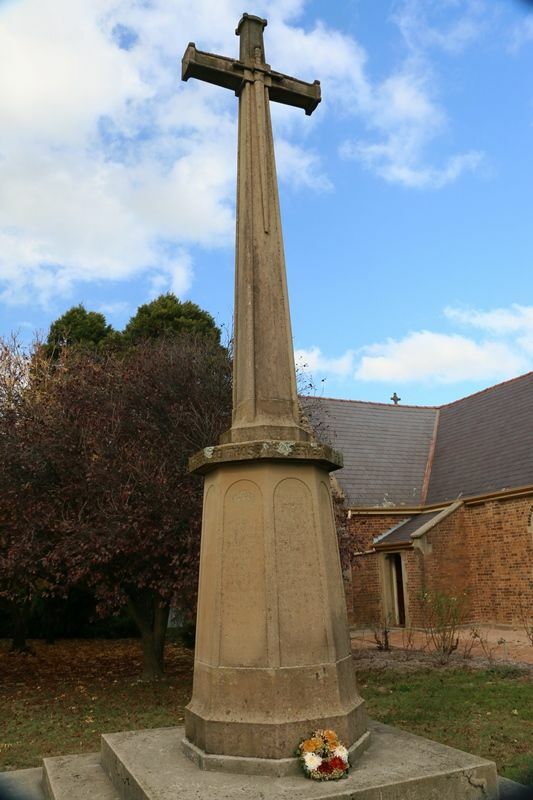 During World War One consideration was given to raising a suitable memorial to those parishioners who had served their King and Country but it was decided to defer the matter until after the cessation of hostilities. After the war it was decided that the memorial would take the form of a Cross of Sacrifice which was unveiled by General Sir Charles Rosenthal in 1921. Blayney was alive on Wednesday with a concourse of citizens from all the surrounding district, including Bathurst, Millthorpe and Orange. Bishop Long and General Sir Charles Rosenthal, the famous hero of Mont St. Quentin, were the chief figures in the procession and on the platform a number of clergy, bank managers, medical men and representatives of commercial interests with Hon. J. C. Fitzpatrick, Mr. Samuel Whitmore, military officers and returned soldiers-the names of many of whom were inscribed on the memorial stone— and leading lady Red Cross and war workers, graced the proceedings. The unveiling and dedication took place after the short service in the church, when splendid reference was made to the unforgettable noble services of those who did not come back, but whose memories were cherished by so many in the gatherings that day, and by hosts of others throughout this loved land of ours, for which the heroes had helped by their sacrifice to win eternal fame. 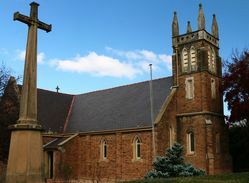 The beautiful stone cross, of which the architectural proportions and lines evoked universal admiration, has been erected facing the main street, and almost aside the entrance of the parish church, and will ever stand as an ideal and simple symbol of the sacrifice of the lifeblood of many of her sons, who did not come back, and the sacrifice, too, alike of soldiers and sailors and nurses, who bear still the marks of long and valiant service, and their willingness to die to protect the land and the Empire they loved. Leader (Orange, NSW), 4 March 1921.